My boss hates Marzipan. He grew up in northern England, where marzipan is a lot more prevalent. I don't think I encountered marzipan until the middle of college, but I've always enjoyed it since then. I also don't understand how he can hate a mild-tasting blend of pureed almonds and sugar, yet love the taste of salted licorice (another childhood treat). Anyway, my favorite marzipan treat is stuffed dates. 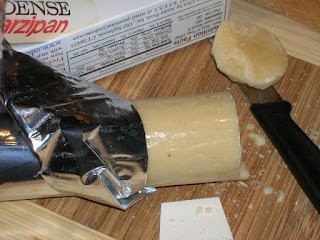 All you do is make a slit along the side of the date, slip out the pit, then stick in a comparable amount of marzipan. It's simple, but delicious. It also gets better after about three days, when the moisture in the date begins to dissolve the sugar. This makes the marzipan soften a bit more and almost blend into the meat of the date. 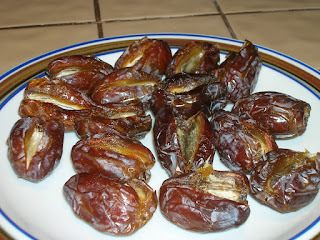 That's another thing: you need to use fresh dates. Those dried baking figs won't be as sublime, resulting in a dry, mealy texture. Sadly, tonight's marzipan was a lemon. When I opened the tube, I was confronted with a hard lump of calcified almonds. Clearly this had been hanging around the shelf far longer than it's intended natural life. Disappointed, but undeterred, I decided to replace the pits with walnut halves. 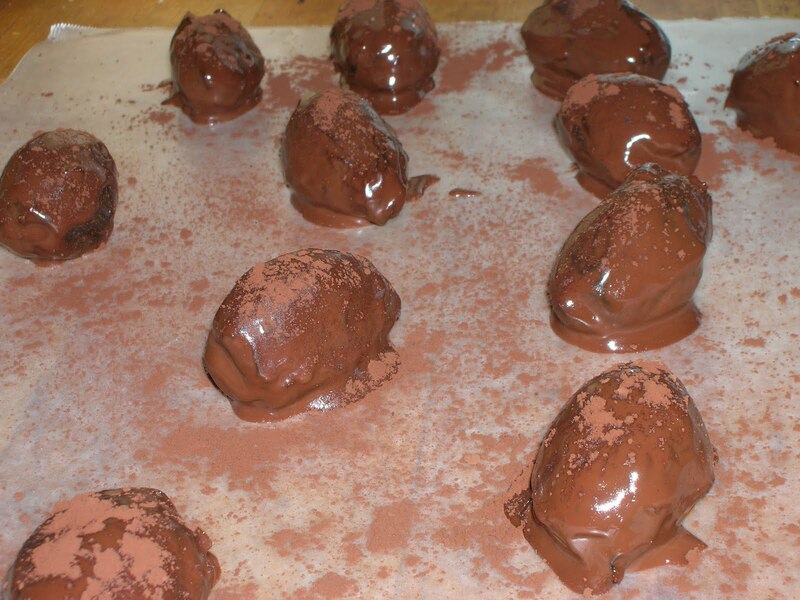 To make the dates more dessert-like, and less like a vegan hors d'oeurve, I dipped them in melted chocolate, then topped them with a dusting of cocoa powder. So now they're more like date-shaped truffles. Still tasty enough to bring to Thanksgiving dinner!